If you’re growing bored with vacations at yet another beach, or you’re sick of tagging along behind exhausting tour groups, you may be looking for something totally over the edge, totally exciting, and if desired, totally costly – like an East African safari. (Swahili word for “journey”) If this is the case, then grab your safari hat, your camera, and your wallet because here’s an example of what that journey could cost you. There are three main regions in Africa for safaris – East Africa (Tanzania and Kenya), southern Africa (Zambia, Zimbabwe, Namibia, and Botswana), and South Africa. This article focuses on East Africa. All safaris come in many different shapes and sizes. There are walking safaris, Land-Rover safaris, canoe safaris, gorilla tracking safaris, elephant-back safaris, flying safaris, camping safaris, and horseback safaris, to mention only a few. With so many different safaris to choose from, one must first select a safari that will be both rewarding and reasonable considering the cost. Safaris can be even custom-designed to your own specifications. The “economy” safaris are ideal for the adventurers who boast that a real safari experience is not to bed down in a cozy lodge before a blazing fireplace but where one can “rough-it out” in the bush zippered into their own sleeping bag. And since “roughing it out” means little of the creature comforts one’s accustomed to, the costs are somewhat lower. Accommodations are usually 2-person pitched tents by an open campfire, bucket showers, and long drop latrines. Dining-tent meals, cleaning-up, and hot water for showers are taken care of by the staff. Setting up and tearing down your tent is the responsibility of its inhabitance. 6-8 passenger mini-vans or other small vehicles are used for transportation and game-viewing. The more “moderately-priced” safaris offer amenities somewhat more comfortable such as lodges with a bar, swimming pool, dining room, and en suite bathrooms. Transportation through the bush is usually in a Land Rover, all meals each day may be included, most meals, or just some. On the other hand, most of the “luxury” safaris offer more lavishness up-scale accommodations such as luxury full service lodges with private rooms and balconies. These hotel-like facilities offer buffet and barbeque dining, a fireplace bar and lounge to relax in, swimming pool, gift shops, etc. All meals are provided and in some cases with china and crystal dining service. Small aircraft are sometimes used to ferry customers to various outlying parks. Since East Africa is blessed with both the Serengeti National Park and the Masai Mara National Reserve, it’s without a doubt, the most popular destination for viewing wild game in all of Africa. $500 for 3-Days – This camping safari includes r/t transportation from Nairobi through the Great Rift Valley for wild life viewing in the Masai Mara National Park. Also contains visits to the Samburu National Park and the Lake Nakuru National Park. Campsite accommodations. $1,100 for 8-Days – Travels to Amboseli National Park at the foot of Mt. Kilimanjaro, Tsavo National Park, Lake Naivash in the Great Rift Valley, and a full day at Masai Mara. Campsite accommodations. $1,100 to $1,400 for 5-Days – Drive from Nairobi to Aberdares, then to Lake Nakuru National Park and the Masai Mara Game Reserve for excellent game viewing. Lodge accommodations. $4,200 to $4,500 for 8-Days – Visits Mt. Kenya, Borana Game Ranch, and Masai Mara. Accommodations at a Country Club, luxury lodges and tented-camps. 5,500 to $6,700 for 12-Days – Travels to Tsavo National Park, Amboseli National Park, Mt. Kenya, Ssmburu National Park, and Masai Mara. Luxury Lodges and private luxury-camps. To many adventure-junkies, a safari is not a bona fide safari unless it includes the most famous location in the world for viewing wild game – the Serengeti National Park in Tanzania. Encompassing some 5,700 square miles, Serengeti offers the best year-round views of wild animals on the continent from cheetahs to zebras. A consequence of this reputation, however, is that safaris in the Serengeti are generally a bit more expensive. $1,100 for 5-Days – Visits Lake Manyara National Park, a day on the Serengeti plains, then a drive 2,000 feet down into the Ngorongoro Crater, home to a wide variety of plain animals. Campsite accommodations. $2,100 for an 8-Days – Safari to Tarangire National Park, 2-days in Serengeti, Ngorongoro Crater, and Lake Manyara National Park. Campsite accommodations. $1,650 to $1,800 for 5-Days – Safari that includes departure from Arusha with wildlife viewing at Lake Manyara National Park, Ngorongoro Crater, and Serengeti.Lodges. $3,750 to $4,200 for 8-Days – Four days in Serengeti, 2 days in the Ngorongoro Crater, and a visit to Lake Manyara National Park. Lodge accommodations. $5,300 to $10,000 for 12-Days – Six-day visit to Serengeti, two day at Ngorongoro Crater, and stays at Lake Manyara National Park and Tarangire National Park. Luxury lodges/private luxury camps. Choice of Amenities – Some safaris may not include air transportation while other safari packages provide air from New York City. Accommodations may vary from a private luxury camp to a lodge, or even just a private tent or hut. All meals for each day may be included, most meals, or just some. The Number of Days in the Safari – The cost of a safari will increase dramatically depending on the number of days in the tour. Traveling Alone or Double-Occupancy – Safari costs for a singe-traveler is usually higher. Whichever safari you select there may be side-trips offered that will be an out-of-pocket expense. If you take a hot-air balloon ride over the Serengeti, it can run about $400-$500 per person. Or you may want to leave the security of the Land Rover to explore on foot. Cost for that close-up and personal experience usually ranges up to $20 or more per person depending on the number of hours expended by your guide. 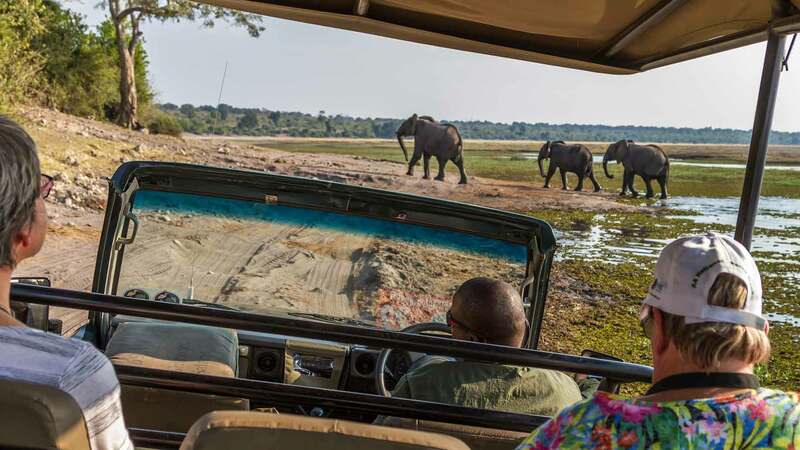 Tipping on safaris is highly encouraged, up to $70 per day for the driver-guide for luxury safaris, with somewhat lesser amounts for park rangers, etc. as well as gratuities for such employees as the bartenders, waiters, room attendants, etc. at the lodgings.